Our team of professionals has the knowledge needed to handle flood damage projects. As home and business owners, we value our HVAC systems. Temperature control throughout the summer and winter months is essential to maintaining a comfortable environment in which to live, work, and play. Like many property management tasks, regular maintenance is an important part of keeping your HVAC system running smoothly. This includes essential maintenance of your ductwork system. When we think about maintenance on a heater or air conditioner, we often think simply of the unit or thermostat we see regularly. However, cleaning out the air ducts is just as important. 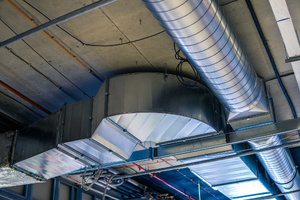 When air ducts are clear, air can move through your home or business more smoothly. This helps your HVAC system run more effectively since any blockages are removed. However, there are even more important reasons to make sure your property ductwork is complete. These reasons are for the health of your home or business and the air quality on your property! Dust and dirt can easily pile up within the ductwork at a home or business property. When the ducts are left unchecked and uncleaned, the dust and dirt will be circulated with the air from your HVAC system. This will result in more dust on the surfaces of your home or business, but also in the air you breathe on the property! It is essential to complete regular ductwork cleaning to ensure that you maintain clean, breathable air at your home or workplace. This is especially important if you notice respiratory problems in yourself or others. If you do, air duct cleaning may be the solution! At AdvantaClean of West Knoxville, we provide a number of different emergency restoration services in the Knoxville, Tennessee area.